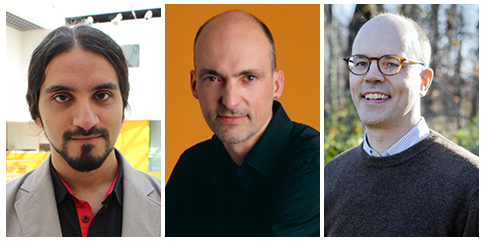 Three researchers with the University of Maryland’s Brain and Behavior Initiative (BBI)— Assistant Professor Behtash Babadi (ECE), Professor Patrick Kanold (Biology), and Professor Wolfgang Losert (Physics/IPST/IREAP)— are part of an 11-investigator team that has won one of nine recent BRAIN Initiative U19 center grants awarded by the National Institutes of Health. The Maryland researchers are part of “Readout and control of spatiotemporal neuronal codes for behavior,” a $20M, five-year project led by John Maunsell, a professor of neurobiology at the University of Chicago. Preliminary data for part of the grant were obtained with the support of seed funding to Kanold and Losert from BBI. The U19 center grants are among the largest awards given by NIH, dedicated to highly ambitious, multi-disciplinary, multi-university projects. The portion of the project coming to the Maryland researchers is expected to be worth approximately $5.3M. Other institutions with investigators involved in the project include NIH’s National Institute of Mental Health, the New York University School of Medicine, the Universidad Nacional de San Martin in Argentina, and the Instituto Italiano di Tecnologia. This connection with NIH strengthens collaborations between the NIH Bethesda campus and the University of Maryland in the area of neuroscience. The project aims to revolutionize our understanding of brain function by providing a unifying account of how brain activity and behavior are mutually informing. Currently, research tends to examine the complex interaction of brain activity and behavior as separate problems, but the U19 team examines how these two elements operate simultaneously: how the external world shapes the patterns of brain activity, how brain activity results in the manifestation of behavior, how the elicited behavior in turn reshapes the brain, and so on. In other words, the project provides a clearer picture of the brain in real time. In the past, neuroscience has mapped what happens in the brain given particular sensory inputs (neural code) and has studied how the different parts of the brain “read” the information contained in the neural activity in order to form behaviors like decision-making (readout). The U19 team’s research considers these two fields in tandem. They offer a unified explanation for the dynamic dialogue between neural code and readout—namely, how the brain simultaneously performs coding and readout in order to translate sensory input into behavior and to adapt its internal activity to the behavioral context. To address this, the U19 team integrates various theoretical and experimental approaches, particularly single-cell resolution imaging, to further control and guide behavior by manipulating brain activity, with a focus on the three senses of vision, audition, and olfaction. The team is composed of computational and systems neuroscientists, physicists and engineers. From UMD, Losert is leading the “Data Science Core,” which aims at streamlining and centralizing the data collection, analysis, and experimental design seamlessly across the various scientific projects. Kanold heads the science project titled, “Determining which Neurons Contribute to a Particular Behaviorally Distinguishable Percept,” with the goal of establishing causal links between neural activity and behavior. Babadi is in charge of neural modeling, statistical data analysis, and model-based experimental design for the three science projects. He is also contributing data science tools to the Data Science Core. The collaborative nature of this project is crucial to investigating the complex relationship between the brain and behavior, as it requires a tight integration of state-of-the-art optical imaging and stimulation, cellular electrophysiology, theoretical modeling, and large-scale data analysis. The U19 team’s unifying framework, which accounts for the simultaneous operation of neural code and readout, will allow the broader neuroscience community to resolve ongoing debates regarding neural coding that have been previously stymied by considering only half of the problem. Season's Greetings from the Clark School!